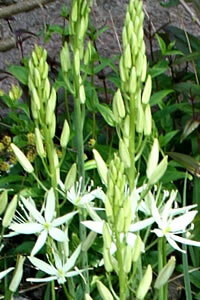 This species can be taller than the closely related Camassia quamash, reaching heights of 1.4m (50in). It also tends to be slightly hardier and better suited to colder conditions. Camassia is now in the family Asparagaceae. For maximum freshness, please keep seed refrigerated in its original packaging until it is time to plant. Fall and winter sowings may be made directly into pots of sterilized potting medium, covered with a thin layer of coarse sand, and placed in a cold frame. Darkness is required to start germination. For mid to late spring sowings, seed should be soaked in pure clean water then placed in pots of sterilized growing medium, covered with a thin layer of coarse sand, and refrigerated for 4-6 weeks. Move pots to a cool sheltered location with bright indirect light to complete germination. Grow in a sunny location. Camas enjoys wet winters and dry summers.